The Birds, The Bees, The Butterflies & the Bugs! A garden filled with flowers, birds, bees and butterflies is a sight to behold. These winged beauties add color, sound and motion to our gardens. Plus, they help maximize a garden’s productivity by pollinating plants and managing plant-damaging pests. But what about those unwanted visitors to the garden? The aphids, mites and cabbage worms that feed upon our plants or the mosquitoes that feed upon us. There are ways to have a beautiful garden and at the same time enjoy the outdoors when we work with nature to manage our landscape. Add a birdbath, a few birdhouses and plants for the birds. They’ll repay you by eating many of the insects that feed upon your plants. Include seed-bearing plants like coneflowers, Rudbeckias and cosmos as well as berry plants like Juneberry, dogwood and firethorn. Add an evergreen and a few trees for shelter and nesting, if space allows. Include a hummingbird feeder and a few of their favorite flowers like columbine, salvia, penstemon, and phlox. Then watch as these fast flyers feed upon aphids, mites and mosquitoes in between sips of nectar. 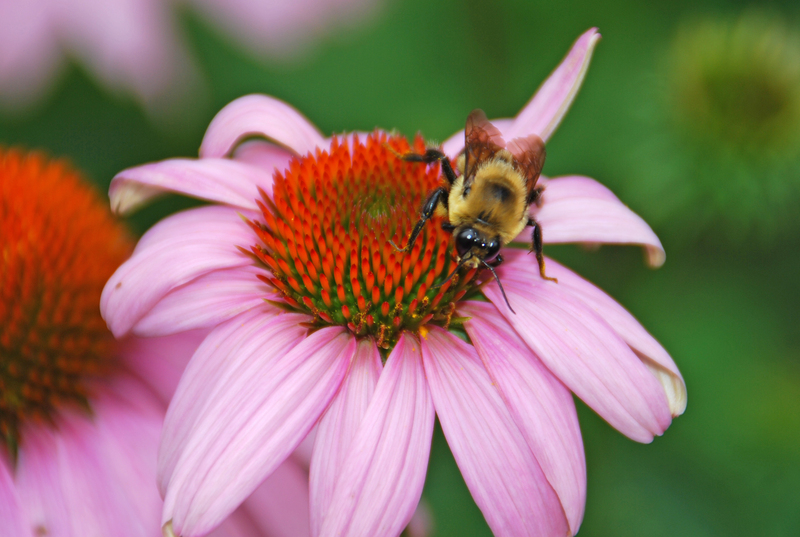 While watching the birds, bees and butterflies, examine your plants for garden pests. Catching insects early may mean the difference between a successful harvest and disappointment. Before reaching for the pesticides and destroying their food source, attract the good guys and manage unwanted pests with a few of these eco-friendly strategies. Tolerate a bit of damage and wait for the birds, lady beetles, praying mantis and other beneficial insects to move in and eat the bad bugs in the garden. Use barriers like row covers to keep cabbage worms off your cabbage, cauliflower, broccoli and Brussels sprouts. Sink shallow containers filled with beer into the soil around hostas and some of the other favorite plants of slugs and snails. These pests are attracted to the fermenting yeast, crawl inside and die. If the bad guys persist, step up your eco-friendly control. Knock small populations of aphids and mites off plants with a strong blast of water. Apply insecticidal soap or Summit Year-Round Spray Oil if nature needs a helping hand. These organic insecticides are effective at managing pests, while gentle on the good guys when used properly. Keep mosquito populations to a minimum. Drain water from toys, buckets or any object that can hold water and serve as a breeding ground for mosquitoes. Change the water in birdbaths several times a week. Toss a “Mosquito Dunk” (SummitResponsibleSolutions.com) in rain barrels and water features. This organic insecticide only kills the larvae of mosquitoes, black flies and fungus gnats. It won’t harm bees, butterflies, birds, pets and people. Evaluate your success and make needed adjustments. Write a note in next year’s calendar to watch for the return of these pests. You’ll be ready to step in and lend nature a hand if needed. As you begin to work in harmony with nature you will find more birds, bees and butterflies visiting your garden. Together you can grow a beautiful and productive garden for all to enjoy. Gardening expert Melinda Myers has written over 20 gardening books, including Small Space Gardening and the Midwest Gardener’s Handbook. She hosts The Great Courses “How to Grow Anything: Food Gardening For Everyone” DVD set and the nationally syndicated Melinda’s Garden Moment TV & radio segments. Myers is also a columnist and contributing editor for Birds & Blooms magazine and was commissioned by Summit for her expertise to write this article. Myers’ website is www.melindamyers.com. Loved this article especially point about The Birds, The Bees, The Butterflies & the Bugs!